Have you ever approached a door that you thought should be pushed when actually it needed to be pulled? The design elements of the door suggested the wrong functionality. The door pictured above opens into Kansas State University's Cardwell Hall. The flat panel suggests that the door is to be pushed, when actually the door needs to be pulled in order to open. When first encountering this door, I routinely made the mistake of pushing. Lot's of people do. 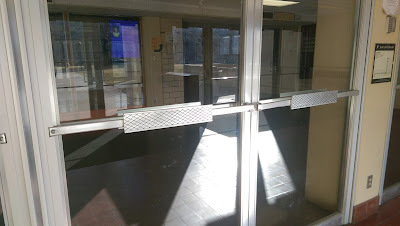 Even when taking the picture above, I witnessed a student attempting to open the door incorrectly. In the design world, this is known as a Norman Door after Don Norman; cognitive scientist, usability engineer, and author of The Design of Everyday Things. I love finding a good couch co-op game to play with friends and family. Over this winter break, I've enjoyed many hours of Overcooked with my dad and younger sister. In Overcooked, 1-4 players are chefs in a kitchen working together to prepare meals. The objective of each level in Overcooked is to serve up as many orders as you can. Each order requires different steps to prepare like chopping up vegetables or cooking meat and then all the ingredients need to be brought together and served. Each level has 3 stars to earn which is determined by your output. The more chefs in the kitchen, the higher the output that is expected of you. This means that cooperation is a must.